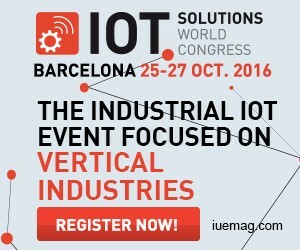 The Internet of Things Solutions World Congress (IOTSWC) will hold its second edition in Fira de Barcelona’s Gran Via venue on October 2016. Organized by Fira de Barcelona the IOTSWC in association with the Industrial Internet Consortium (IIC) the trade show and conference aims to quickly connect technology and industry and also create the best possible platform for companies and experts to discuss together new strategies and Internet of Things (IoT) developments. On this second edition the Congress will structure its conferences in six areas: Manufacturing, Transport & Logistics, Healthcare, Energy and Utilities, Technology, and Innovation. The IOTSWC Program Committee – comprised of high-level IoT and technological professionals and innovation specialists– will select leading international figures to participate as speakers at the conference. Additionally an international Call for Papers has been launched aiming to include the most relevant contributions, initiatives and solutions within the IoT framework in the congress program. The event has also launched two other calls: a Call for Testbeds and a Call for Awards. The former call will select the best examples of real life industrial internet solutions to be showcased in the Testbed area located in the heart of the exhibition area. The ten best among all entries and will grant them a prominent location to be showcased at. The last of the three calls will award the best solutions presented by exhibiting companies in each of the program’s areas and the best testbed. In all three calls, the Program Committee will be responsible of analysing all entries and selecting the best of them. This year’s committee includes representatives of ABB, Accenture, Cisco, Deloitte, EMC, GE, Industrial Internet Consortium, Infineon Technologies; Intel, Ipso, Microsoft, National Instruments, Object Management Group,SAP and Schneider Electric. On its first edition, IOTSWC featured 120 top experts, 88 exhibiting companies and 4,500 visitors from 53 countries. Any facts, figures or references stated here are made by the author & don't reflect the endorsement of iU at all times unless otherwise drafted by official staff at iU. This article was first published here on 19th July 2016.